Kobelco’s latest Geoscan remote monitoring system is aimed as much at single-excavator owner-operators as large businesses with extensive fleets, according to the company’s sales and service manager, Doug McQuinn. 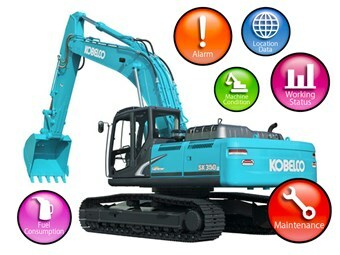 Kobelco’s Geoscan remote monitoring system. "Tracking and managing your fleet is critical to business success," McQuinn says. "Traditionally, this task has been particularly challenging in larger fleets where equipment is deployed across multiple sites and in rental businesses where machines are being used by a wide range of operators." However, he says this has now changed with the company’s newest remote fleet tracking and management system, Geoscan, which is the result of a three-year intensive review to ensure equipment owners can access the data they need. Geoscan, which comes standard on Kobelco Acera Geospec excavators of 7 tonnes and over, allows businesses to track fuel levels, service schedules, working hours and other data. The data is available to key staff via their smart phones. "Statistics like location, work mode, fuel burn and key on-off times can help fleet managers and owner operators assess asset utilisation, plan maintenance and make decisions about how to use equipment for optimal productivity and return on investment," McQuinn says. "The data remote monitoring system collects is only useful if it’s simple to access and work with. Kobelco has invested significantly in making sure Geoscan is user-friendly and brings all the information you need straight to your phone or computer," McQuinn says. Improve efficiency by reviewing the breakdown of operational hours or gather historical data to identify trends and better plan for future works. Know where the machine is now and where it has been in the past. View location data on a web map or Google Earth. Instant notification by email of critical fault alarms as well as operational alarms such as low fuel level, maintenance due, machine moving out of set map area or engine started outside a set time period. Keep up to date with filter and oil change intervals.